The Bodfari War Memorial commemorates those men of the area who died during World War I and World War II. The memorial takes the form of a marching soldier, standing on a marble plinth, in the churchyard of St. Stephen's Church. Bodfari is a rural village in Denbighshire. The ancient parish comprises the townships of Bodfari, in historic Flintshire, and Aberwheeler, in historic Denbighshire. Between 1974 and 1996 the area was part of the county of Clwyd. 34408 Canadian Machine Gun Corps 27 Jun 1918 28 Son of John & Elizabeth Evans, of Bryn Tirion, Bodfari; husband of Maysel Agnes Parry-Evans, of Prescott, Ontario, Canada. Halifax Memorial, Nova Scotia, Canada. William Taylor 36th Bn. Machine Gun Corps (Infantry) formerly 38632 Gunner Motor Machine Corps 16 Apr 1918 20 Son of Titus H & Julia M Hewitt, of The Warren House, Bodfari. Terlincthun British Cemetery, Winille, Pas de Calais, France. A/1052 1st Bn. Canadian Infantry (Western Ontario Regiment) 30 Aug 1918 32 Son of Margaret Roberts (formerly Jeffreys), of 1, Stanley Brow, Denbigh, & the late Thomas Jeffreys. Upton Wood Cemetery, Hendecourt-Les-Cagnicourt, Pas de Calais, France. formerly Grenadier Guards 1 Jul 1916 20 Son of James and Elizabeth Kiernan, Tyn y Ffordd, Bodfari, Flintshire. Born Bodfari. Brandhoek Military Cemetery, West-Vlaanderen, Belgium. (3rd Bn.) 11 Apr 1916 24 Son of Abel and Jane Kilbee, 7 Fisher Row, Oxford. Born Oxford, England. Poperinghe New Military Cemetery, West-Vlaanderen, Belgium. 874558 27th Division, Canadian Infantry (Manitoba Regiment) 25 Sep 1918 29 Son of John and Mary Owen, of Gwern Hwlcyn, Bodfari. Died of wounds at Denmark Hill Hospital, London, England. Brother of William Lewis Owen below. St. Stephen's Churchyard, Bodfari. (1st/5th Bn.) 9 Mar 1918 20 Born Rock Ferry, Cheshire, England. Son of John and Mary Owen, of Gwern Hwlcyn, Bodfari. Brother of John Owen above. Jerusalem War Cemetery, Israel. (1st Bn.) 16 May 1915 37 Husband of Elizabeth Jane Parry, 47 Bank Place, Denbigh. Born Bodfari. Le Touret Memorial, Pas de Calais, France. (13th Bn.) 26 Aug 1918 29 Born Tremeirchion. Son of Joseph & Harriet Roberts, of 2, Caradoc Terrace, St. Asaph. 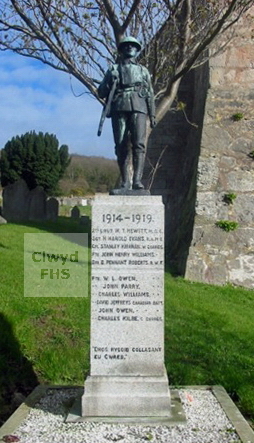 Also commemorated on the St. Asaph and Tremeirchion War Memorials. Ste. Marie Cemetery, Le Havre, Seine-Maritime, France. Royal Army Service Corps. 1 Nov 1918 28 Born Bodfari. Resident of Afonwen, Caernarvonshire. Son of Edward and Jane Williams, Bryn Tirion, Bodfari. Etaples Military Cemetery, Pas de Calais, France. (1st Bn.) 15 Nov 1916 29 Son of John Williams of Foel Gaer, Bodfari. Grove Town Cemetery, Meaulte, Somme, France. (3rd Bn.) 9 Apr 1943 27 Son of Isaac & Sarah Jones, of Bodfari; husband of Edith Florence Jones, of Bodfari. Enfidaville War Cemetery, Tunisia.